Daniela Ruah assumes a number of false identities for her role as undercover agent Kensi Blye in the procedural TV series NCIS: Los Angeles. In real life, the American-Portuguese actress also takes on multiple roles: that of being an actress, a wife, and a mother to her son River Isaac Olsen, born in January 2014. Fortunately for Daniela, she is allowed to bring her son with her to the set: “Our show has been very kind to me and they let me bring my son to work.� So I get to spend the whole day with him, so in that sense, I get to be a full-time mom. Of course I have somebody there to help me take care of him because when I’m on set I can’t do that. But, essentially, I’m present in his day, you know, 24 hours a day, which is what I’ve always wanted. Daniela’s husband, David Olsen, is the brother of Eric Olsen, who plays Kensi’s partner and love interest, Marty Deeks. David also sometimes acts as Eric’s stunt double. FAMILY ON SET. Daniela tells us that her main co-stars--Chris O’Donnell, LL Cool J, Eric Olsen, Linda Hunt, Miguel Ferrer, Barrett Foa, and Renee Felice Smith--are as much as a family to her as her real-life one. “I think the funnest days are when everybody is there, when the whole cast is there, when we’re shooting the scenes, like in the bull pen. The way we bond is when they’re moving the cameras around, or when we have a few minutes break when they’re doing something technical. NCIS: LOS ANGELES. At the end of the last season, special agents ‘G’ Callen (Chris O’Donnell) and Sam Hanna (LL Cool J) are left trapped in a drug cartel submarine that was packed with the explosive substance ammonium nitrate – and the series returns right back to cliffhanger. As the team tries to locate and save Callen and Sam, the focus also falls squarely onto Hetty's (Linda Hunt) struggle as she is due in Washington to be questioned by the Senate for her failed mission in Afghanistan. The highly-trained agents of the Naval Criminal Investigative Service continue to do what is necessary to protect national interests. On season 6 of NCIS: Los Angeles, fans will get to see Kensi and Deeks give their romantic relationship “a shot,” says Daniela. 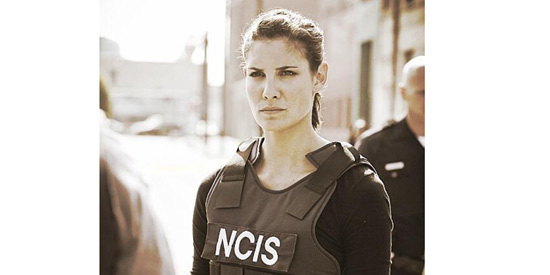 As for Kensi, she has to face her demons and deal with the consequences of the events that transpired in Season 5. NCIS: Los Angeles Season 6 will premiere in the Philippines this Thursday, July 2, at 9:45 p.m., on AXN (available on SKYcable Channel 49, Cignal Digital TV Channel 49, Cable Link Channel 38 and Destiny Cable 61).